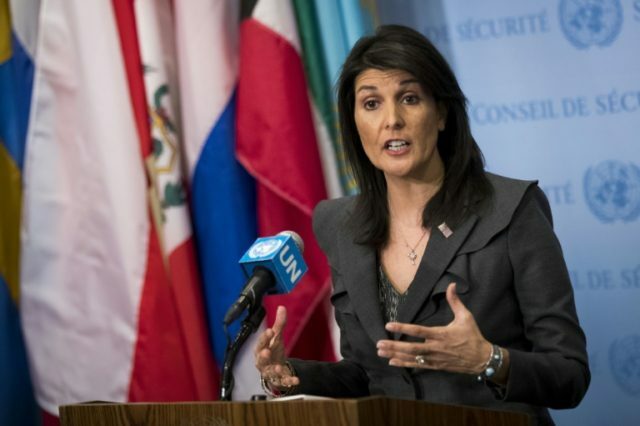 TEL AVIV – The U.S. on Saturday blocked the UN Security Council from issuing a resolution expressing “grave concern” over Israel’s handling of Hamas-planned riots along the border with Gaza and calling for an “independent and transparent investigation” into the violence. It also called “for respect for international human rights law and international humanitarian law, including protection of civilians,” according to a copy of the draft seen by AFP. Both Israel and the Palestinians were called upon to “exercise restraint and prevent a further escalation,” the draft said. It also called on the sides to work towards peace based on the two-state solution. The Palestinian Authority on Saturday charged the U.S. and Britain with preventing Arab efforts to issue a Security Council resolution condemning Israel for the 16 Palestinians killed during the clashes. Their refusal meant the U.S. and Britain were “accomplices in the horrific massacre committed by the Israeli occupation army against our defenseless people,” spokesperson for the PA Yusef al Mahmoud said. He added that Washington and London showed “bias in favor of oppression and suppression.” He also claimed that the protests were “peaceful marches and demonstrations” commemorating Land Day. The Security Council summoned a closed meeting on Friday night to discuss the situation, ignoring a request from the US and Israel to postpone the meeting until Saturday because of Passover. The following day UN Secretary-General Antonio Guterres called for “those concerned to refrain from any act that could lead to further casualties.” He also said there should be an independent and transparent investigation into the deaths and injuries during Friday’s clashes. At least 10 of the 16 Palestinians killed were identified as members of terror groups, the IDF said Saturday. The army published a list of the terrorists along with their positions in various terror groups – with eight of them coming from Hamas. The riots saw rocks and Molotov cocktails hurled at Israeli soldiers along the border from a crowd of some 30,000 Gazans attempting to storm the fence. There was an instance of live fire as one rioter shot at IDF troops. The “March of the Return” was initially billed as a “non-violent” protest that organizers promised would take place a half-mile away from the border fence, with no attempts to breach it. The IDF responded mainly with tear gas and rubber bullets, and only rioters who explicitly used violence against troops or who were seen damaging or breaching the security fence were targeted with live fire, the army stated. Some of the terrorists who were killed were said to have attempted to place bombs along the security fence. Friday’s “day of rage” coincided with both Passover eve and Palestinian Land Day, which marks events in 1976 that reflect the Palestinians’ struggle to own the land. The protest will be ongoing until May 15’s Nakba Day – the day of “catastrophe” that marks the establishment of the State of Israel.